This autumn we figured we’d give you an early Halloween treat and share with you our list of the best tools and resources available for all web professionals, regardless of whether you’re a seasoned professional or just starting out, working in a large team or free lancing. The following tools are guaranteed to make your life and your work a lot easier. The Muffin Group is a passionate team of creators who produce web applications and WordPress templates. They are not only creative minds, passionate about they work, they also have a lot of experience under their belts. The best proof is their BeTheme for WordPress, which boasts more than 150 ready to use layouts and 19 customizable header styles. This is by far the biggest theme ever created. Packed with goodies and intuitive, BeTheme can be used for a vast number of purposes. BeTheme isn’t called the biggest WordPress theme ever for nothing. It boasts a one click installation, it works wonderfully for E-commerce websites, it has unlimited menus, and a wide variety of pre-defined demos. You no longer need coding skills or programming knowledge to start up your own website. Leave it to the Muffin Group to make your site look stunning and professional. The BeTheme has a top of the line admin panel, a layouts configurator and is constantly receiving updates. Designed for speed, it works flawlessly with any browser and is compatible with WooCommerce, MailChimp, bbPress, Contact form 7, W3 Total Cache and basically all popular plugins. If you need any help starting up, you can take a look at the comprehensive BeTheme user guide or contact Muffin Group support forum for any issues. Emphasizing visual perfection, the creative minds behind Artbees produce top of the line design assets, stunning WordPress themes and excellent icon designs. All their products encompass thorough research, a well-crafted strategy and customizable features. This is obvious in one of their most popular products, the Jupiter WordPress theme. This tool has helped over 20,000 users create and maintain their websites. But Artbees weren’t content to leave things as they were so they put in a lot of time and work into improving Jupiter and, as a result, this November will bring Jupiter V5. From a programming standpoint Jupiter V5 come with deep codebase refactoring, a complete theme re-structuring and massive performance enhancements. As far as design and visuals are concerned, Jupiter V5 brings to the table: more header stiles, shape dividers, shape icon boxes, gradient coloring capability for page elements, blending effects doe page sections, more Google fonts, fancy title ornaments, new buttons and a lot more. You’ll also be able to integrate your website with social media easier than before with Twitter, Instagram and Quote blog posts. But these aren’t the only new features of Jupiter V5, be amongst the first who get it this November and find out for yourself how much it can help your website. Argento is not like any other template – it was especially created from the ground up based on the best E-commerce stores practices and according to the guidelines for Magento developers. Argento, a Magento template, comes packed with more than fifteen popular Magento extensions and a sleek, fluid layout right out of the box. Based on CSS3, with CSS and JSS files created on a clean code that can be merged and minified with the default Magento minifier, Argento also impresses with its speed. If you want to make sure that your website will look just as great on all devices, Argento is the perfect choice for you, as it was built to work on iOS, Android and BlackBerry. This means that you will save money by not having to invest in another template or the use of a mobile application. Even more, Argento provides your online store with a improved HTML structure, resulting in better SEO performance manifested in the correct usage of SEO important tags and HTML attributes. 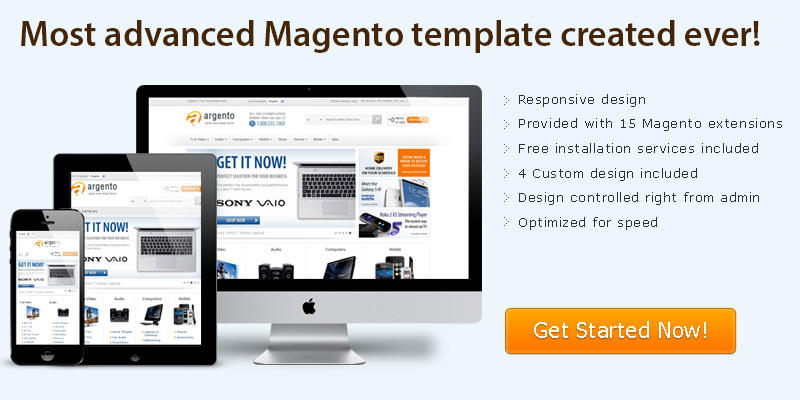 To top it all off, the Magento professionals will have your new Magento responsive template installed within a day, for free. Keen Themes is a talented team of professionals that deliver premium quality themes. The Jango Frontend Theme is a Bootstrap HTML5 template that is fully responsive and user friendly. The Conquer Theme is a Bootstrap Admin theme boasting an advanced mega menu and all-purpose layouts. We’ve left the best one for last: the Metronic Theme, also known as the most famous multi-purpose Bootstrap admin theme. With more than 32,000 sales, the Metronic theme can boast AngularJS 1.3 support, Twitter Bootstrap Framework, one of the most powerful frameworks for responsive web applications and an unlimited array of colors. On top of all of that, Metronic has super clean code and more than 700 templates pages. Dubbed ‘not just a theme’, Metronic has 7 ultimate admin themes and will save you over one thousand hours of UI coding, not to mention costs for development. Multi-purpose, highly efficient, precise and responsive, this admin dashboard theme is sure to supply your every need. If you’re still using Excel spreadsheets to keep up with your employees’ leave time, then you definitely need actiPLANS. actiPLANS is a powerful tool that is here to rid you of unnecessary paperwork and late nights. With an intuitive interface and a user friendly work schedule for each member of your team, you’ll find that keeping track of everyone’s leave time requests doesn’t have to give you a splitting headache anymore. actiPLANS makes everything easier both for managers and for employees. The former have all the essential info right at their fingertips. No more being taken by surprise by an employee’s holidays and missing deadlines because of an understaffed team. All employees have to do is to request leave time in one click and wait the notification whether the request is approved or rejected. actiPLANS comes with flexible rules for PTO, easy to customize leave types, comprehensive charts and reports, as well as a leave time history for every team member. Starting this November, it also comes with a mobile app that allows you to send a leave request or notify co-workers when you’re running late on-the-go. If you often lose track of your time spent working on different projects, then you need actiTIME – simple and flexible time tracking software. Dubbed ‘Timesheet for smart decisions’, this incredibly intuitive tool will help you keep tabs on all the hours you spend working on a task or a project. In addition to this, it will also register leave time and allow you to add comments to your time-track. Keeping an eye on budget and deadlines has never been this easy before. actiTIME enables its users to set deadline reminders and budget control notifications. This nifty program knows everything about boosting performance and keeping expenses under control. If you’ve never been able to manage your working hours properly, actiTIME will do it for you. Used by more than 9,000 companies around the world, this time tracking tool offers comprehensive reports on staff performance, cost of work, overtime, expenses and many others. What’s more, a user-friendly mobile app for iOS and Android keeps you up to speed with your progress and expenses at all times. We’ve all heard countless times that a picture is worth a thousand words, and this is something that holds true about web screenshots of bugs as well. However, a screenshot isn’t always as comprehensive as a developer might like, and this is where BugMuncher comes in. A website’s icons can really give it a distinct feeling and set it apart from others with a similar target audience. If you want to make sure your website (or even your mobile apps) always looks sharp and elegant, then you need to get your icons from Icons8. The minimal application for Windows and Mac, Icons8 App, provides you with a great selection of icons, with themes ranging from business, city and computer hardware to food, gaming and social networks. With these icons, your website will look flawless, as they match the style of the operating system’s native icons. These icons are compatible with Windows 10, iOS 9 or Android 5 Lollipop. Within the app you will also find other cool features such as icon recoloring, fast search, export to Photoshop, Xcode, etc., recoloring and resizing, as well as the possibility of choosing format (SVG, PNG, PDF or EPS). In need of a cheap, yet efficient web hosting provider? Daily Hosting provides you with the best web hosting reviews that tell you everything you need to know. You will find exhaustive information about all the criteria you need to factor in before choosing a web hosting plan for your website. Daily Hosting keeps you up to speed with the latest web hosting offers that will meet all your requirements and won’t burn a whole in your pocket. The free hosting guide allows users to look at several hosting companies and compare them in order to choose the best offer that suits their needs. With dozens of reviews, Daily Hosting helps you make an informed decision. Their blog contains even more details about web hosting that will transform any newbie into a well-informed buyer. You don’t have to take a leap of faith when you invest in a web hosting solution. To make sure you make the best decision, head over to Daily Hosting, and look over their reviews for pros and cons. The best way to increase your site’s conversion rate is to keep your customers happy. Fire Checkout will help you do just that. The name is self-explanatory. Your buyers won’t have to spend time filling in 6 pages of useless info just to place an order. Instead, this Magento one step checkout will help them finish this last step quicker than ever before. Fire Checkout is fast, intuitive and incredibly flexible. With a minimalistic 3 column layout and Ajax based Coupon code support you’ll be able to increase your sales effortlessly. Fire Checkout allows you to add two custom content blocks, locate your customers’ country and city and create as much as 5 custom fields. Ready to watch your sales figure sky rocket? Fire Checkout delivers fast results thanks to its cutting edge features. Optimized for all types of devices and created with user experience in mind, this tool is available in 12 languages and is 100% open source.